Up to this point, Test Kitchen has successfully showcased the talents of a number of Executive Chefs and Chefs de Cuisine. 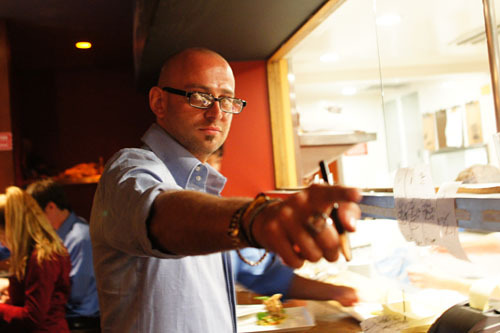 TK co-founder Brian, however, had always wanted to provide a forum where up-and-coming Sous Chefs could show off their own culinary repertoires. Thus, the idea for a "young guns" night was born. 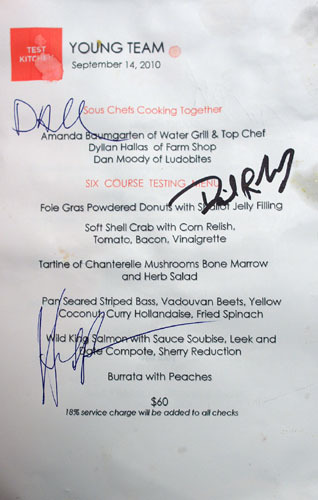 A troika of chefs was selected to participate. 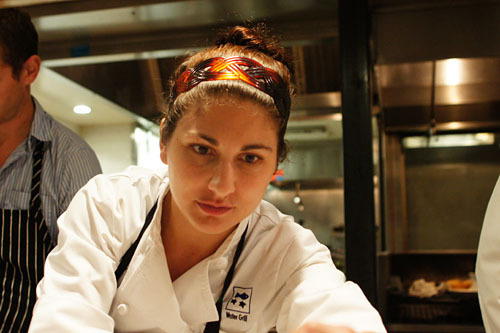 Perhaps the most well-known of the group is recently-departed Top Chef contestant Amanda Baumgarten, who currently works as a Sous Chef at Downtown's Water Grill. 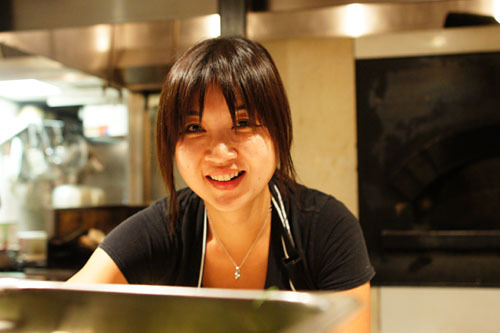 Previously, she held Executive Sous Chef positions at Ford's Filling Station and Paperfish, and before that, worked at Patina and Melisse. 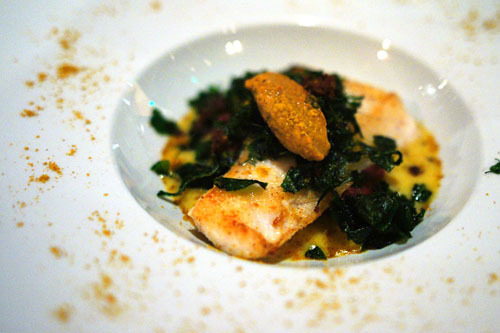 Baumgarten attended the Le Cordon Bleu school in London, and also cooked at La Tante Claire and Le Gavroche. We also have Dan Moody, a.k.a. The RelationChef. 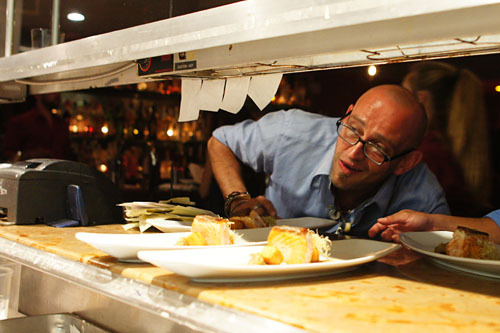 The CIA-trained Moody cut his teeth at L'Orangerie under Ludovic Lefebvre's tenure, and is a fixture in the kitchens at LudoBites. 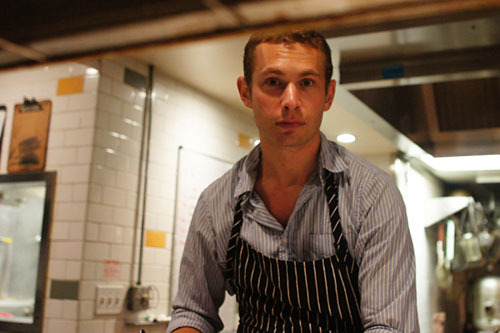 Rounding out the triad is Dylan Hallas, whom I first met at The Tasting Kitchen in Venice. 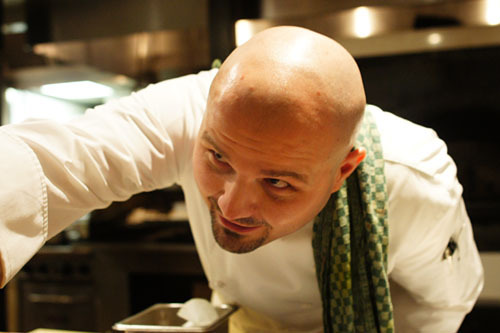 Hallas attended the CSCA, graduating in 2003, with his first job out of school being at Pasadena's Trattoria Tre Venezie. He also cooked at Osteria Mozza, The Bazaar, Vincenti, Providence, the short-lived Ursa, and is currently slated to join the team at Jeffrey Cerciello's upcoming Farm Shop. 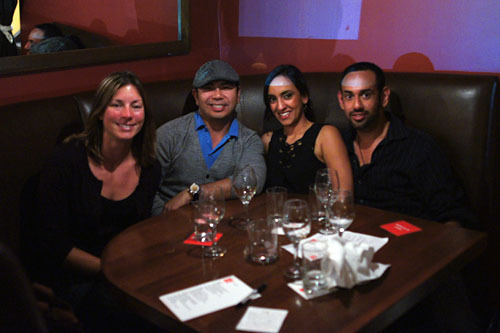 Longtime reader Jai brought along a few foodies from UCLA Anderson's FEMBA program: Andrea, Ric, and Iknam. He also generously provided a trio of wines for us to enjoy: the Perrier-Jouët Champagne Belle Epoque, a 2009 Pascal Janvier Jasnières Cuvée du Silex from the Loire Valley, and a 1994 Spottswoode Cabernet Sauvignon from Napa. Tonight's menu was a six-courser for $60. A foursome of cocktails, meanwhile, was created for the dinner by mixologists Brian Summers and Joel Black. Click for larger versions. Naturally, we had to order a round of all the cocktails. 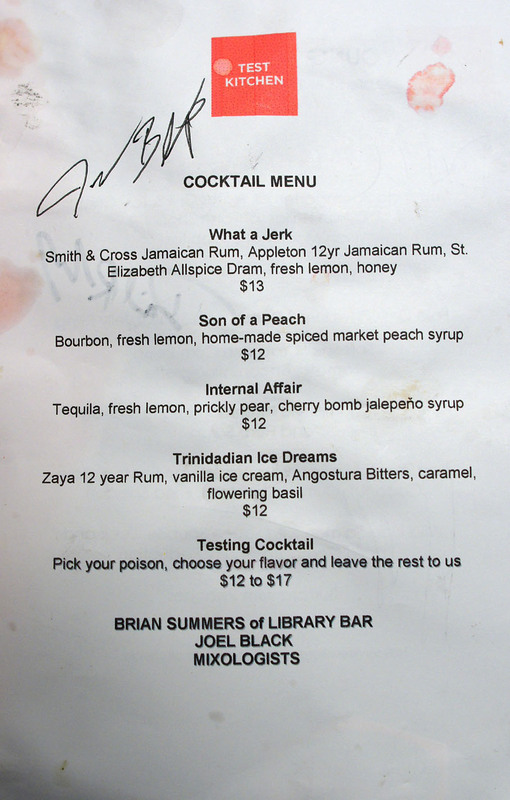 First up was the What a Jerk (Smith & Cross Jamaican rum, Appleton 12yr Jamaican rum, St. Elizabeth Allspice Dram, fresh lemon, honey), which had a great bit of citric tang on the nose and attack, leading to a weighty body characteristic of rum. The finish was fantastic, resplendent in notes of sweet-spicy goodness. The Son of a Peach (bourbon, fresh lemon, home-made spiced market peach syrup) was even better, with a superb interplay between the gravity of the whiskey and the sugariness of peach, all moderated by an amalgam of cinnamon, black pepper, fennel, and coriander. 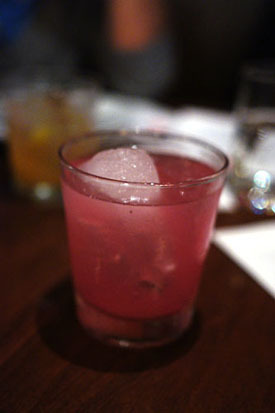 Next, we had the Internal Affair (tequila, fresh lemon, prickly pear, cherry bomb jalapeno syrup), which had a lovely spicy-saccharine nose and a weighty, woody base of tequila perked up by a bit of sweetness and a tinge of heat from the jalapeno. 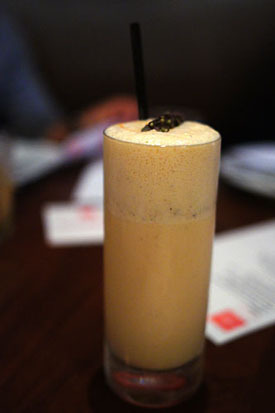 We ended with my favorite of the quartet, the Trinidadian Ice Dreams (Zaya 12 year rum, vanilla ice cream, Angostura bitters, caramel, flowering basil). I loved the almost tropical sweetness of the cocktail, intensified by the overarching weight of the caramel, all over a luscious base of ice cream. 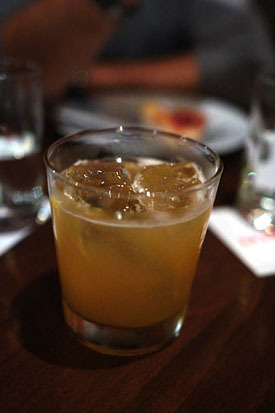 The basil and bitters, at the same time, provided a tempering complexity--excellent. Moody was up first, and hit it out of the park with an almost Ludo-esque presentation of foie gras. 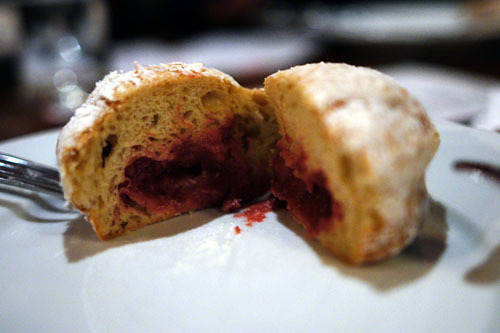 Though these beignets may look like your typical jelly-filled doughnuts, they were anything but, showing off subtly sweet, delicate notes of foie, beautifully complemented by a carnelian filling of leek, beet, fig, and shallot. 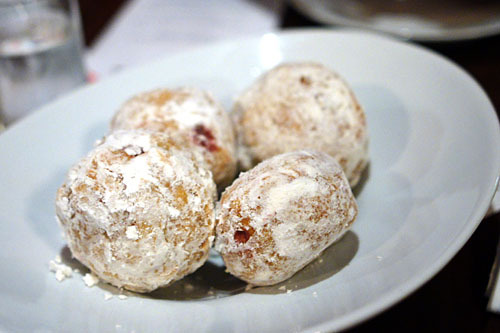 I very much appreciated how the liver was countervailed by the vegetal notes of the leeks and shallots--making for a rather well-integrated dish--as well as the slight sugariness provided by the employment of tapioca powder on the donuts' exteriors. Regular readers will recall that I'm no fan of soft shell crab. 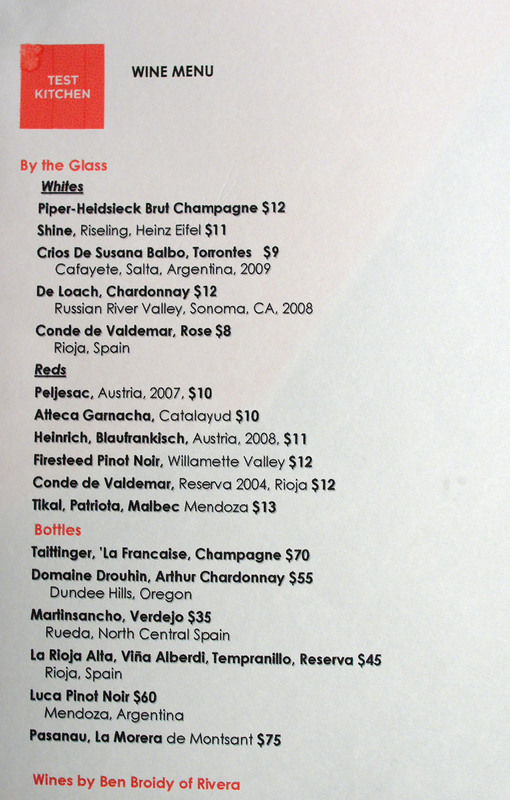 Baumgarten's version here, however, was one of the strongest I'd ever had. The crab itself was deftly prepared, showing off the nature of the crustacean beautifully, and had a superb texture to boot. 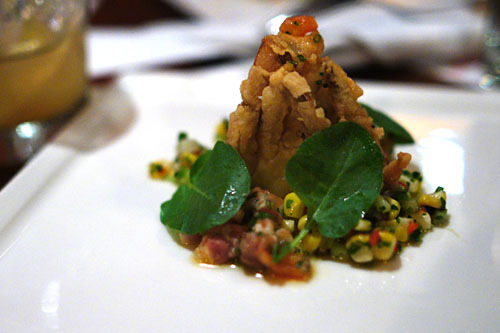 I was afraid that the corn would be overwhelming, but rather, it accented the decapod's inherent sweetness perfectly. Even better were the tomatoes, which added a refreshing, juicy succulence to the dish. Hallas' tartine (a fancy word for open-faced sandwich) was another standout of the meal, easily one of the top bone marrow dishes I've eaten. I loved how the mushrooms worked alongside the heft of the marrow, forming a gorgeous admixture of tastes and textures. This was expertly balanced, however, by the usage of the various veggies (parsley, tarragon, frisée) paired with a red wine vinaigrette and olive oil. The toasty bread, meanwhile, served as a moderating element, and also added an apt crunch to the course. Yes, that's Holly of The Michelin Project cooking in the kitchen. She was brought on by Moody, who'd worked with her previously at LudoBites 4.0 (she was a stagiaire there). Bass came well-cooked, and I really enjoyed the stark temperature contrast presented by the fiendishly tart frozen vinaigrette. However, the sweetness of the coconut was a bit distracting for me, and I could've used less vadouvan as well; I wanted the character of the fish itself to be more apparent. Things were improved, though, by the application of beets and spinach. Baumgarten's Top Chef best bud Alex Reznik was helping to expedite. Reznik, of course, recently left Ivan Kane's Cafe Was, and is currently looking for a new project; he is not, however, working for Vartan Abgaryan at this point (as I previously speculated). The two chefs actually met and became good friends after working at Lutece at the Venetian, Las Vegas. The salmon arrived with an interesting story: apparently, it was caught by a Captain Andy Nitby, who won a lottery that allowed him to fish for this Alaskan salmon pre-season. In any case, the fish came adroitly cooked to a pleasantly rare temperature, and demonstrated a beautifully briny, fatty character with a great savoriness. 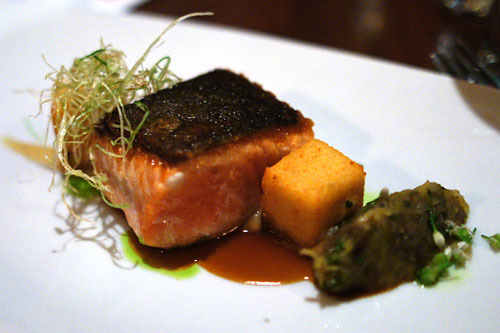 The salmon easily stood alone, though the sherry reduction (replete with a bit of veal jus I think) did augment its flavor. I also appreciated the slight piquancy of the leek-date compote, though the soubise was a bit too potent for me. 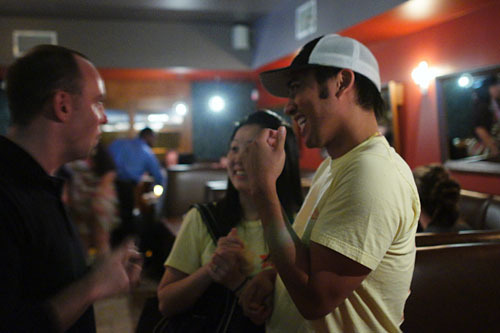 Starry Kitchen's Thi and Nguyen Tran were in the house, seen here chatting with Stephane Bombet. Dessert was somewhat unconventional, not surprising given that the dish was originally intended to be a savory course. 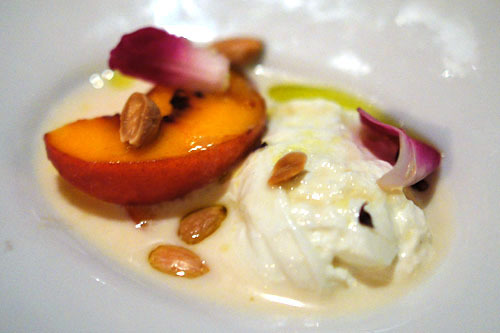 Hallas chose to use Di Stefano burrata, which he paired with cherry liqueur-infused peaches in a sweet & sour almond syrup. The dish showed off an intriguing interaction between the unabashed sweetness of the fruit and the bit of saltiness from the cheese, all leading to a delightfully nutty finish; it was a slightly disconcerting experience at first, but it worked. 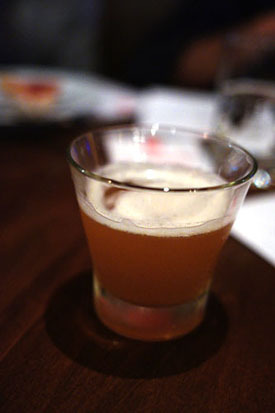 To celebrate the fact that Test Kitchen is now the most written about restaurant on this blog (surpassing my six posts about Urasawa), Brian had Joel Black whip up a celebratory shot. 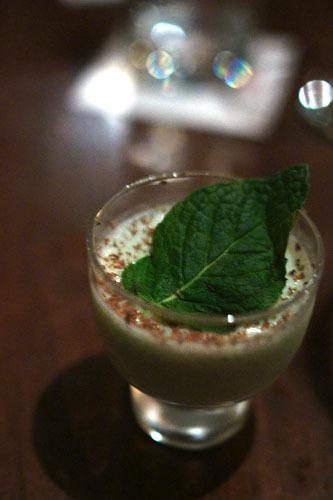 The resultant concoction was deemed the Drunken Mint Chocolate Chip (vodka, vanilla ice cream, white crème de cacao, mint, amaretto, dark chocolate), and was simply superb, drinking like a boozy mint chocolate chip ice cream--this one needs to go on the cocktail list pronto! Tonight's dinner at Test Kitchen was another success, a fitting tribute to the unsung heroes of the kitchen. 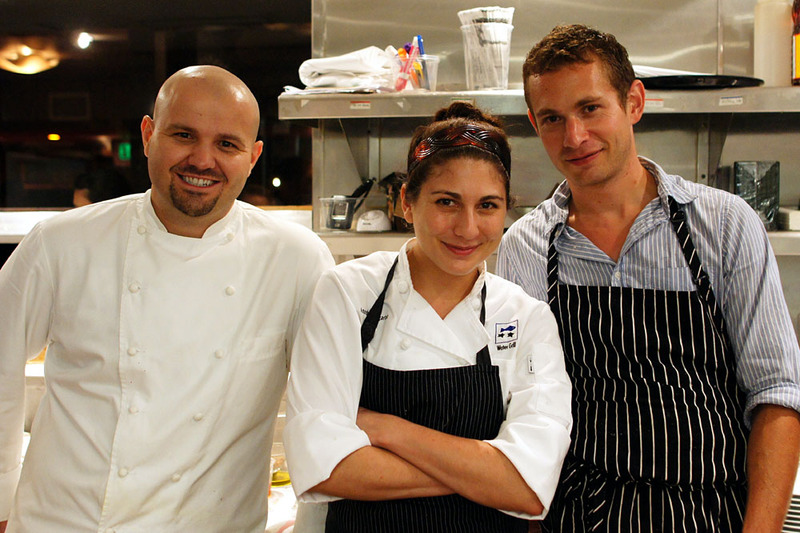 And in fact, I wouldn't mind if each one of these three chefs got his or her own night here. Good to see you tonight! Sorry I missed this, but had impromptu dinner with Ludo (& you KNOW I couldn't pass that up!). Whoa, Alfred E. Neuman cooked there?! Oh, wait.... nevermind! I'm in awe that you were able to get these photos out with such low lighting! Well done, as usual. Ha ha Jai. Thanks for coming guys, but did you have to post a picture of me where I look like I'm on a 3-day bender? 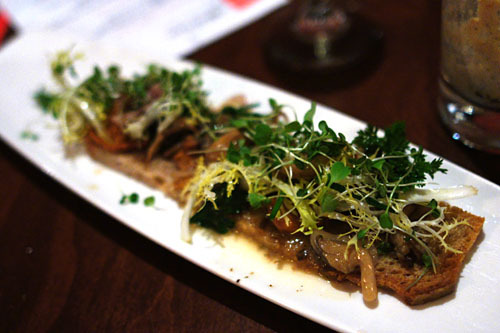 I almost passed out (after drooling) seeing the roasted bone marrow and chanterelle dish. Amazing combo and you described it well! um, when are you not on a three-day bender? you're a true test kitchen groupie kevin! 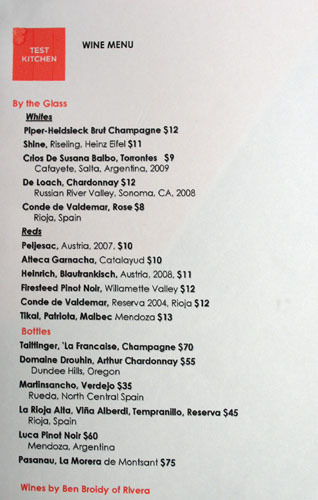 menu looks awesome, dishes seemed innovative. I'm eagerly awaiting the opening of Farm Shop, have you heard anything about when? Jo: Where did you guys go??? Jai: The resemblance is uncanny, isn't it lol? Wasima: It was quite the dish indeed. You going back anytime soon? Jai: Better drunk than high? Amy: Without the sexual connotation, of course. Stephanie: Nope, haven't heard anything about Farm Shop as of late. And apparently, due to the delays, Dylan may not even end up there.